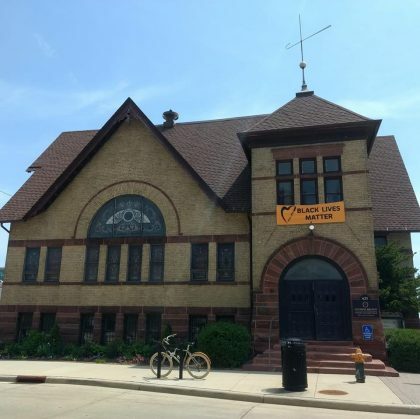 Located at the heart of historic downtown Racine, WI since 1842, our building is both traditional and contemporary, and reflects our commitment to the inclusion of people of all ages, abilities, and mobilities. Learn about the accessibility of our church and programs. The Main Entrance is located at 625 College Ave. Our wheelchair accessible entrance is on the southeast corner of the church, on 7th Street. The congregation’s office (Annex Office) is located at 419 6th Street, Racine, WI 53403. This is also our mailing address. The office is open from 1:00 pm to 5:00 pm Tuesday through Thursday, all other times are by appointment. Contact our office. Street parking is located on College Avenue, 6th Street, and 7th Street. Handicapped parking is on 7th Street on the south side of the church.